Pachislo slots are popular Japanese slot machines (as they originated from Japan) but famous all over the world. Pachislos (pronounced PATCH-ee-slows) look much like any slot machine you would find in a Las Vegas casino. In Japan, Pachislo slot machines take tokens rather than coins, and are only used for a couple of years before they are sold to casinos elsewhere in the world (and sometimes to private owners; you occasionally find these in homes as collectibles). But they differ from American slots in small but significant ways. Like they operate only on tokens, not currency, they supposedly involve some skill: below each spinning wheel is a button that stops it manually, meaning pachislo players earn their jackpots by hitting the button at the right moment. Also, they are not just slot machines. Many of them, particularly the newer models, have LCD screens on which elaborate video-game-style narratives play out. Let us find out what these machines are, how they operate and how to play Pachislo. Many Americans like Eddie Cramer, Rita Schack, Brian Evans and many more such slot machine collectors have Pachislo at their home. Not only these machines are awesome having some oddball traits like colorful anime-style graphics, ear-splitting sound effects with Japanese approximations of American themes like “Rambo” “Harley-Davidson” and like an “Obama Inauguration” Pachislo comes decorated with an image of the president, arms folded, in front of the presidential seal and an American flag. Pachislos are considerably cheaper than American slots: basic machines cost about $250, whereas a decommissioned Las Vegas slot machine can cost from $800 to $2,000. In Japan, compulsive pachislo players are known to sit glassy eyed for hours in seedy pachinko parlors (named for the vertical pinball game that spawned pachislo). In the United States, however, the obsession seems to be more about collecting than playing. Collectors speak of sacrificing whole floors of their homes to accommodate their ever-growing collections. They gather on sites like Pachitalk.com and PachisloDB.com to share reviews of the newest machines or trade tips on where to find rare ones. And YouTube is filled with hundreds of hours of pachislo enthusiasts showing off their chirping, flashing collections. 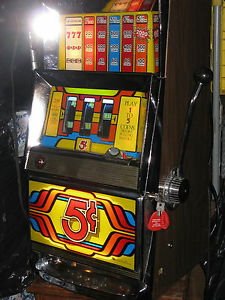 Having Pachislos slot machines depends in which state you live like two states, Connecticut and Washington, have ruled that pachislos fall under existing laws barring home ownership of slot machines, and most dealers won’t ship there. Other states, like California, have deemed them legal as long as they are not converted to accepting cash. So before you think of having one of these machine it is better to speak with either your local police agency, the district attorney’s office or consult with an attorney. Still, because pachislos are sold and traded almost exclusively online, and because most states don’t seem to put much effort into enforcing laws against them, most collectors have no trouble acquiring pachislos wherever they live. All Pachislo machines basically operate the same way and have the same features so you will not find any difficulty in getting started. First to power on or turn on the machine you need to plug your machine into a standard outlet. Then place your key into door lock, turn to the right to open door. Locate and turn on your Power Switch. Most are a toggle switches located on the power supply, which is usually located on the bottom left of the machine. After you have tested the Power Switch, turn in off once more to load the hopper with at least 100 tokens. Also get familiar with the hopper by removing it, loading it, and reinserting it. Hoppers are connected with either one bundle of cords coming from the power supply to the hopper that can be unplugged at either end, or by a plug at the base of the hopper that is plugged in when you insert the hopper. Now turn Power Supply back on. If the credit display is lit (0), the machine is in the credit mode. All subsequent winnings will be added to the credit meter. If the credit display is not lit, the machine is in the automatic payout mode. All subsequent winnings will be automatically dispensed into the coin tray. To change between modes, press the Credit Collect button while the machine is idle. You cannot change modes while the machine is in play or when tokens have already been inserted. Also some machines like Yamasa and Daido will only operate in CREDIT mode. This is in the programming of the machine and cannot be changed. On some machines like Olympia the Credit or Cancel button must be held down for 5-10 seconds to dispense coins into the coin tray. Credit Mode is when your winnings are added up in the Credit window as they are won and only dispensed when you manually dispense them. Direct Play Mode is when all winnings are automatically dispensed into the coin tray as they are won. To play in Direct Play Mode hold the Collect Button down to discharge any coins held in the Credit Meter. After all coins are in the coin tray, press and hold the same button for a few seconds until the symbols “__” appear on the Credit Meter instead of a zero. The machine is now in direct play mode and will automatically dispense all winnings into the coin tray. To play in Credit Mode hold the Collect Button down for a few seconds until “0” appears in the Credit Meter window. If your machine is malfunctioning you will need to reset your machine and this is the same procedure used for setting the payout odds. It is a simple procedure that can also be used to reset your machine for a variety of error codes, the most common being that you have hit a large jackpot and there are not enough coins in the hopper to payout the winning. Odds levels are adjustable from 1 to 6. The odds levels vary by machine, and different manufacturers set their odds level to different settings from the factory. To change the odds you will need to access the inside of the machine. You can also find specific machine odds sometimes posted on the inside of the door by the coin mechanism. Payout levels are the average payout over 10,000 coins. Just like in a casino you will hit winning streaks and losing streaks. The odds may vary by machine. The payout level can be changed, but the payout percent at a given level cannot be altered. Also use the Reset Button on the Power Supply or on the back of the door to change the odds number from 1 to 6. When you have the odds level you want, press down the Spin Knob and the odds are set. Finally turn the toggle of key back to the “Off” position and you are ready for play. Your Pachislo has the capacity of holding up to 50 credits on the Credit Meter. There are a few exception that hold more, but this is the general rule. Instead of moving up to 51+ credits the machine will automatically payout any amount of credits over 50. For example, if you have 49 credits on the Credit Meter and you hit a winning combination for 2 credits, the Credit Meter will move to 50 and automatically dispense one coin to the Coin Tray. If you do not fill the hopper with a few hundred coins you will need to reset the machine each time you hit a bonus that gives you a large payout and causes the hopper to run out of coins. How to play Pachislos slot game? When you are ready just insert at least three tokens into the machine. You will hear them register but will not see them register on the machine as a number. The first three coins will show up on the left or right of the reels as being registered. The first token will light up the center payline, the next token will light up the upper and lower paylines, and the third token will illuminate the diagonal paylines. Three tokens gives you maximum play, any further tokens you insert will register on the Credit Meter as 1, 2, 3, 4, etc. You may insert up to an additional 50 tokens, the 51st token will be rejected and drop directly to the Coin Tray. To begin playing some machines require you to push the Maximum Play button then push the black or red Spin Knob down. On others just push Spin Knob. This will start the reels spinning. On some machines there are two buttons instead of a single Max Bet button. This allows the player to play 1, 2 or 3 credits. Each reel is then stopped independently by pressing one of the three round buttons on the front in any order. When you enter a Bonus Game you will know it and you will be given additional guaranteed wins during the next several plays depending on the bonus combination. Most bonus games pay a maximum of 500 coins over the course of the bonus. Bonus Games take place on the center payline only. When your Bonus Game is over a “Game Over” light may flash or an “oF” error will display on the machine. If this happens the machine must be reset. On Type B machines once you enter a Bonus Game you must play until the machine enters a Challenge Game. If you enter this game you are forced to finish the game before you can reset the machine. In this case the hopper may run out of tokens, so make sure you have hundreds of tokens in the hopper, or you pause often to remove the tokens from the Coin Tray, open the door, and put them back into the hopper. The following three unique features of the Japanese slots make this slot variation appealing for the players. The stock is a kind of bonus accumulation. This stock includes bonuses which were collected but not obtained as the player did not manage to hit the bonus symbols during the game. The Renchan is a situation when the slots player gets a number of bonuses in a row and takes the probable payouts of about 5000 and even 10000 coins. The tenjÅ is the same thing as the ceiling. It is the maximum limit of games which could be played among the releasing of every Stock. Like assume that the tenjÅ is 1600 games and till this moment there were 1590 games played. So, it is for sure that after next 10 games there will be the release of the Stock. Free spins are common and if you win a free spin you do not have to do anything but press down the Spin Knob to start the reels. It will automatically replay the last number of tokens you had played on the previous spin. Online Pachislo works very much like any other online slot game and online Pachislo is basically just inspired by offline Pachislo. So you don’t need to worry about tokens vs. coins. Just check the pay tables and the requirements for the online Pachislo game you are thinking of playing to see what you need to put in and what you can win. There are even progressive jackpot Pachislo machines online which are linked up to other machines around the world and offer huge payouts. It is also worth pointing out that the “reels” on a Pachislo machine online are not literal reels. While this is obvious, it bears stressing because you have to remember that even if a Pachislo machine online offers you a “stop” button, you are not really stopping real reels. Your results are being generated by a random number generator (RNG), just as with other types of slots at the online casinos. The above information about Japanese slot machines have been taken from various online sources as well as from Pachislo manual. Pachislo slot machines are much more common than its online counterparts and you buy one for yourself from the online stores like realsloltsmachinesforsale or ebay.